In 1980, Renault introduced their new R5 Turbo as a pure homologation special to compete in 'Group 4' racing and international rallies. The 5 Turbo was based on the production Renault 5 Alpine, but Renault Sport engineers scrapped the standard front-engine, front wheel drive layout in favour of a mid-engine, rear drive setup. In 1981, Jean Ragnotti and his co-driver Jean-Marc Andrie won the Monte Carlo Rally outright for Renault, and the following year Ragnotti won the Tour de Corse. In 1984, 'Group B' homologation was sought for the Renault Maxi 5 Turbo to enable it to contest the World Rally Championship and the following year, Ragnotti added another Tour de Corse win with the Maxi 5 turbo. After the first batch of 400 road cars had been made to satisfy 'Group 4' homologation volume requirements, a second generation, known as the 'Turbo 2' was to follow. On offer from a private collection, this example presents very well in its factory colour scheme of Pearl White paint and Brown leather with Alcantara interior. The first owner of Turbo 2 chassis #943 was at the time a Renault dealer-principal and decided to upgrade his Turbo 2 for a more rally-like soundtrack and appearance, upgrades included an aluminium Matter roll cage, a Devil exhaust, and Gotti split-rim wheels. Within the document file, you will find a Heritage Certificate confirming that the chassis and engine numbers match and upon inspection you will find both the roll cage and the spare wheel are model-year correct. A recent full inspection by Renault 5 Turbo specialist, Olly Melliard, showed that mechanically this example is excellent, with a strong engine generating very good oil pressure. The gear linkage has been 'rose-jointed' to improve driveability and, on road test, the car apparently performed very well. This is a well-known car within the Renault Turbo 2 fraternity and is regarded as a very honest and solid example. As such, it was recently filmed for Top Gear (to be aired in the near future) and is featured in this December's issue of 'Classic Cars' magazine. To be sold with its V5, document folder including recent invoices for a full professional detail, recent mechanical maintenance, current MoT, and older invoices. Genuine examples of this iconic rally thoroughbred rarely come to market and, offered at a very realistic guide, this is a great opportunity to acquire a car that will not only put a smile on your face every time you turn the key but could also turn out to be rather a smart investment. The Autosport International Show Sale takes place on Saturday 12th January 2019 at the NEC, Birmingham. Viewing of the lots will be available from 09:00 to 18:00 on Thursday 10th / Friday 11th January and from 09:00 to 14:00 on Saturday 12th January 2019. Bidding at the auction can be done either in person by attending the sale, by telephone, by leaving a commission bid or live, online via Proxibid. 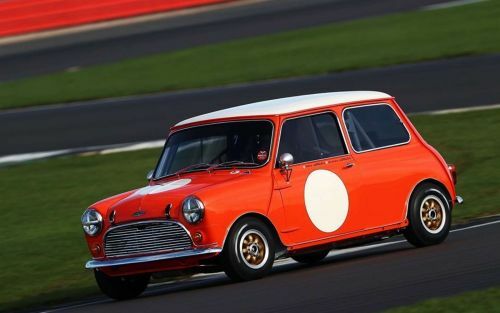 Full details of registration requirements and a buying guide can be found on the Silverstone Auctions website http://www.silverstoneauctions.com/buying. On each day, the automobilia and watches auctions start at 11am and the car auction starts at 2pm.